Andrew Dlugan at Six Minutes posted an excellent list of Christmas gifts for speakers. 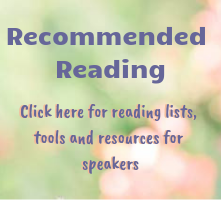 Make sure to check it out for gift ideas for your favorite speaker -- or for yourself! I thought I'd piggyback on his post to add some of my favorite tools that I've mentioned in the past. 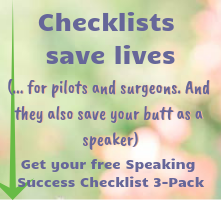 National Speakers Association "Speaker Magazine"
And last, but not least, how about a t-shirt, mug, magnet or tote bag for your favorite speaker? 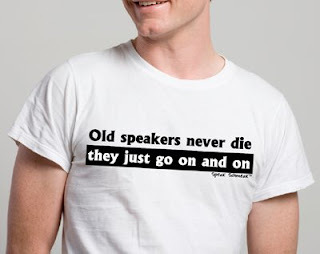 Sayings include, "Speakers do it in front of an audience," "Old speakers never die, they just go on and on," and "I could talk 'til you're blue in the face." And these items aren't just for the pros; I give the "No Hecklers" mini-buttons out to clients and audience members. Just a few ideas for your holiday shopping list!